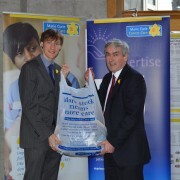 Wearing his daffodil with pride, Iain Gray MSP lent his support to Marie Curie Cancer Care’s Great Daffodil Appeal at the Scottish Parliament this week. Mr Gray met staff and heard about the work of the charity that cares for terminally ill patients and their families across Scotland. He also handed over a bag of donated clothing to help stock the charity’s shops. “I’m delighted to support Marie Curie Cancer Care’s appeal, and would encourage as many people in East Lothian as possible to do so too. To find out how you can get involved in the Great Daffodil Appeal visit www.mariecurie.org.uk/daffodil or call 0845 601 3107. 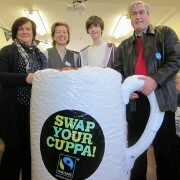 The county’s MSP and MP attended two local Fairtrade Fortnight coffee mornings on the weekend to show their support for the annual awareness raising campaign. Iain Gray and Fiona O’Donnell first went to the Dunbar Fairtrade Group’s coffee morning at the Townhouse, where they supported the group’s message to local people to swap their usual cuppa for Fairtrade tea or coffee. The pair then dropped into the North Berwick Fairtrade Partnership’s breakfast event at St Andrew’s Blackadder Church and chatted to people about their reasons for supporting Fairtrade. New figures released by the independent regulator of Britain’s railways show that all of East Lothian’s train stations saw increases in their use for the period April 2012 to March 2013, with Prestonpans station recording an increase of over 12 per cent. The Office of Rail Regulation’s estimates of station usage statistics record the number of passengers travelling to and from each station (entries and exits). The figures are based on ticket sales data recorded in rail industry systems. All of the five stations within Iain Gray’s East Lothian constituency showed increased usage in the period 2012/13 compared with the same period in 2011/12. The increase of 26,432 at Prestonpans station was by far the largest, taking the total number of entries and exits up to 237,070. Longniddry showed the second biggest percentage increase (8.83%) taking its total up to 177,840, while Drem’s increase was estimated at 7,906 (7.48%) to total 113,556. North Berwick recorded an increase of 19,598 up to a total of 489,680, representing a 4.16% increase. Dunbar station showed an increase of 3.13% over the year. Mr Gray welcomed the increased station usage as good news for public transport in the county and suggested that it also underlines the strong case for the introduction of a new Dunbar local service. 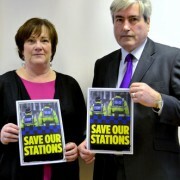 “I welcome the fact that all five of the stations in my constituency have seen good increases in their use over the period covered by these figures. This is positive news for the travelling public, the local economy and train operators. While the operators still have many issues to address, not least the cost of fares, the figures show that the public can be enticed to use trains more frequently. County MSP Iain Gray used a recent members’ debate in Holyrood to speak out about the potential impact of withdrawing East Lothian’s two police traffic wardens, and urge Police Scotland to think again on its plans. 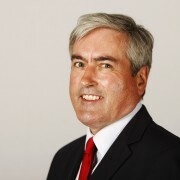 Mr Gray highlighted the fact that the five towns in his constituency – Haddington, Tranent, Prestonpans, North Berwick and Dunbar – already have significant parking problems, with little alternative for people who want to come into the towns other than to bring their cars. He spoke of Haddington community council having already expressed concerns about traffic chaos in the town at a time when the county still has traffic wardens. He also stated that while East Lothian has seen a reduction in traffic wardens over the years, the remaining two ensure that parkers know that there is the possibility that they will be ticketed if they park illegally. The MSP ended his speech by urging Police chiefs to think again and the Minister to speak to them about a last minute rethink. “With only a few days to go until the loss of county’s traffic wardens, I was pleased to use this debate to highlight local concerns about the impact of Police Scotland’s decision to withdraw them. “This is not just a question of inconvenience to motorists. There are also safety issues, and local businesses depend on their customers being able to find a place to park. In North Berwick, for example, local businesses already complain that, on occasion, visitors come to the town, try to find a parking place, fail, leave and go somewhere else. That situation would surely only get worse without traffic wardens. “All of the county’s towns face the potential for significant traffic chaos after the wardens are gone. Serious concerns have been expressed across the county, but once again, as with Haddington’s courts, Scottish ministers have simply looked the other way and washed their hands of the problem. 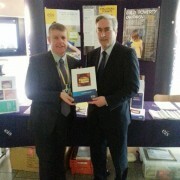 Iain Gray MSP met with representatives of the EIS teaching union at Holyrood last week and gave his support to its new Child Poverty campaign. The campaign is aiming to raise awareness of the consequences of inequality in society and highlight child poverty, specifically in relation to the impact on learning and teaching in Scottish education. EIS will be highlighting the campaign to its members and local communities in the coming months with the intention of influencing the approach of the Scottish Government, as well as local authorities. “I welcome this new EIS campaign and the important focus it is putting on the educational impact of child poverty. More than one in five children in Scotland currently live in poverty, meaning they lack many basic needs taken for granted by others. But it’s clear that the impact of poverty goes beyond financial and material needs. It affects the ability of children to learn, their emotional resilience and wellbeing, and their social interaction and development. County MSP Iain Gray visited Dunbar Primary School last week to speak to P7 pupils as part of the school’s ‘World of Work’ event. Parents and carers also participated in the programme of meetings and talks which took place between 18th and 21st February. The event gave all P7 pupils at the school the opportunity to hear more about the range of career opportunities that are available to them. Mr Gray spoke about his role as East Lothian’s Member of the Scottish Parliament and answered some of the pupils’ questions about his work. 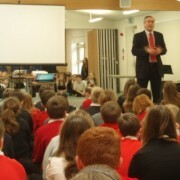 “I was pleased to be invited to speak to Dunbar pupils at the school’s ‘World of Work’ event. Bringing parents and carers with a range of different job and career experiences into the school gives pupils a chance to learn more about the employment options that may be available to them. There is less than a year until Haddington’s Sheriff and JP Courts are due to close. I remain firmly of the view that closing the county’s courts is wrong and will effectively snuff out the local delivery of justice in East Lothian. One of the many arguments against closing our courts was the uncertainty surrounding capacity at Edinburgh’s courts. Official figures released last year showed a 50% increase in the number of in summary complaints registered at Edinburgh’s JP Court for the three months ending August 2013. They also showed outstanding summary complaints had risen by 139%. The number of Edinburgh Sheriff Court summary complaints increased by around 42% for the same period, with outstanding complaints rising by around 49%. These huge increases have come about before Edinburgh’s courts have started taking on the additional caseload from Haddington and appear to confirm fears about the potential future capacity in Edinburgh. I was pleased that East Lothian Council raised these concerns directly with Justice Secretary Kenny MacAskill and urged him to think again on the court closures. I have also written to Mr MacAskill and echoed the Council’s concerns. I pressed him to remain open to the possibility that Haddington’s courts should not close if those in Edinburgh are incapable of taking on the additional workload. I do not want victims and witnesses in East Lothian to face ever longer waits for court appearances and for justice to become inefficient and remote. When SNP ministers took the decision to close the courts they also made vague promises of introducing videolink facilities and family hearings in Haddington to retain some local administration of justice. Months later, there is still no sign of a coherent plan for delivering this. As things stand, it seems that locally-delivered justice here in East Lothian really will come to an end next January. Local Labour politicians have welcomed confirmation from police chiefs that the front counter at Tranent police station will remain open to the public. Police Scotland have confirmed via email that following further consultation with key stakeholders, the decision has been made to keep Tranent police station front counter provision open between Monday to Friday 0900 – 1700 hours. As set out in the amended proposal circulated in December, the counter provision at Haddington police station will change to Monday to Friday 0900 -1700 hours. 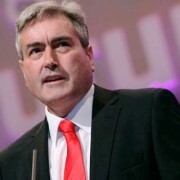 Iain Gray MSP, Fiona O’Donnell MP, and Labour Fa’side councillors, Donald Grant, Jim Gillies and Shamin Akhtar, led the opposition to the original plans to close the front desk. Their campaign included securing hundreds of local signatures for a petition urging Police Scotland to rethink the plans, making a strong submission against the closure to the public counter consultation, and tabling a motion opposing the proposal at East Lothian Council. “I welcome this final confirmation that the front desk at Tranent police station will remain open. Local people, including Fa’side’s councillors and Tranent and Elphinstone Community Council, played a key part in campaigning against the original closure proposal, and I want to pay tribute to everyone in Tranent and the surrounding villages who supported the campaign. “The proposed closure of the police public counter in Tranent raised many uncertainties and fears among local people and the communities of Fa’side were united in their opposition to it. I think it was that strong desire to keep the front desk open and the station accessible to the public that made the difference and ensured that the police acted on the concerns. The new operating times will take effect on the 3rd March 2014. Pupils from two local primary schools were welcomed to the Scottish Parliament by Iain Gray MSP last week, in the latest of a series of educational visits by youngsters from the county. Mr Gray met the groups of pupils, from Sanderson’s Wynd and Yester primaries, at the Parliament and answered their questions about how it operates and his own role as East Lothian’s constituency MSP. The visits were part of the Parliament Education Service’s ongoing School Visits programme to introduce children to Holyrood and how it works. Several East Lothian schools have now taken advantage of this service to visit the Parliament and provide their pupils with the opportunity to find out more about how it functions and what MSPs do there. “I always enjoy welcoming pupils from East Lothian to Holyrood. It’s great that local schools work so hard to help ensure children are well informed about our political process. Many schools from around the county have now visited the Parliament, with hundreds of children benefiting from the experience. Visit www.scottish.parliament.uk/visitandlearn/Education/613.aspx for more information about the Parliament’s education service.